For the second year BBQ Recon hit up the Houston BBQ Festival. 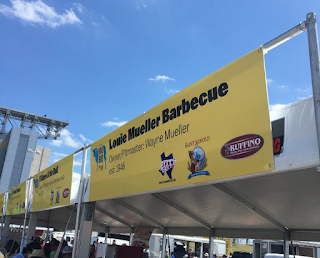 A lot of popular Houston names were there, and this festival truly shows that Houston has come into its own as a BBQ destination spot. One of the true joys of a festival like this is getting to sample the creativity that people can bring to BBQ. While we all love a well-prepared brisket or some juicy ribs, there's something to be said for trying something a little different and adventurous. Even if some of the experiments don’t work out that well, it's still good to see people taking chances and pushing the boundaries a bit. After all, places like Valentina's didn't get where they are by playing it safe. Loni and I were here last year, so we knew what to expect. Joining us was our friend Bryan (no, not the excellent @bbqbryan), who was attending his first BBQ festival. And was he in for a treat. While there was plenty of brisket and sausage to go around, there were a lot of special treats to go with them! Gerardo's came out with some excellent Baracoa tacos. While this may seem basic, they were well seasoned and show that Tex-Mex BBQ is here to stay. Pappa Charlies had a wonderful candied pork bite, along with a great sausage! Corkscrew convinced me that I need to smoke my next prime rib. Why would you do it any other way?!? Louie Mueller brought their beef rib (always one of the best around), and their lamb popper was outstanding! Spring Creek BBQ had some really great glazed ribs and some excellent jalapeno poppers (and I say that as a person who doesn’t normally like jalapeno). Pinkerton's had some great burnt ends (I got their late and missed the other good stuff). But they also had some awesome shirts! And there were quite a few other good things as well that I may not have gotten pictures of. All of it was good. But if I had to pick my top two favorite things I tried, it's a tossup…. Roegels BBQ teamed up with John Brotherton and was offering smoked pastrami that I could have cheerfully eaten all day. Seriously, this needs to be a regular menu item if it isn’t already! Killen's had their (always excellent brisket) and an excellent rib. But they also offered a pork belly bite that probably needs to be classified as a controlled substance. In other news, reports that a man in a BBQ recon was hitting people on the head and taking their pork belly have been taken completely out of context! Hats off to Houston BBQ for throwing an excellent festival! Things went very smoothly, and I love that they had us pre-banded before opening. It made getting much smoother. I have a huge list of places we need to visit more formally, so better start making plans! I'm interested in reserving this place because choosing the right venue which does not favor a specific culture becomes difficult. Halls here have fountains and elaborate pictures. Chicago event space display traditional artifacts and paintings.